When the Founding Fathers were sitting at the table, contemplating which direction to take the newly independent United States, one of the most difficult decisions they had to make was how to structure the government. They were faced with two options: anarchy, and at the other extreme end of the spectrum, tyranny. Anarchy didn’t provide enough law, while tyranny gave too much power to the government. What they were in search of was something that fell somewhere in the middle. It would become what many people would call the greatest political experiment ever to be tried. People’s Law was a revolutionary system of government at the time and one that had only been sketched out on paper and in journals of thought. The government would be kept under the control of the people with enough power granted to the government in order to maintain security, justice, and good order but not enough power that they could abuse the people. And, of the limited powers the government would hold, would be divided in order to have a check and balance. Again, so that their power couldn’t be used as an abuse of the people. Illustrated above, you will notice a stark contrast in the placement of power. On the left, we see the power structure working from the top and trickling down to the individual. Very little power is given to the individual in this example. 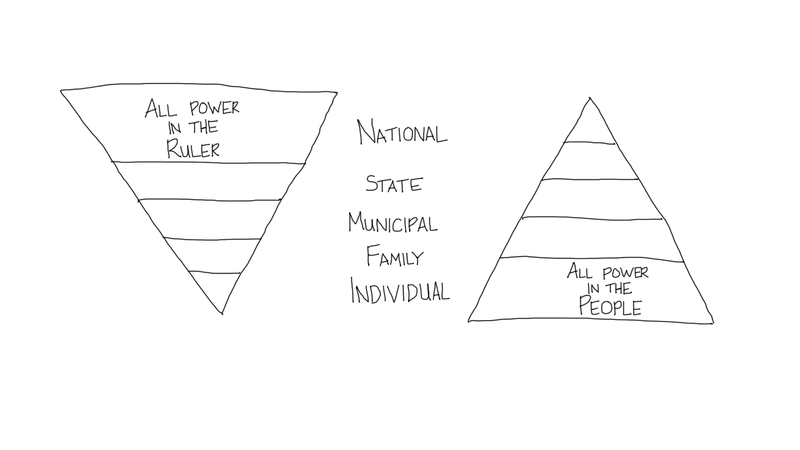 The majority of the power resides at the top at the national level. 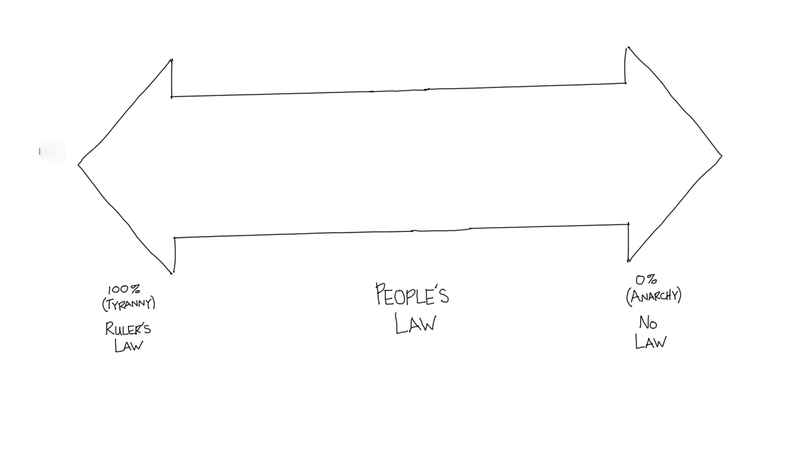 When you compare this Ruler’s Law model on the left with the People’s Law model on the right, which falls in the middle of the first diagram, you see the reversal of power. A model the Founding Fathers would become particularly attracted to. The powers delegated by the proposed Constitution to the federal government are few and defined. THose which are to remain in the State governments are numerous and indefinite. … The powers reserved to the several States will extend to all the objects which, in the ordinary course of affairs, concern the lives, liberties, and properties of the people, and the internal order, improvement, and prosperity of the State. The entire idea was to keep the power base close to the people.